I love my new table. I keep peaking in the dining room to see if it’s really as beautiful as I remembered. This peice is gorgeous. The assembly was easy. I did it by myself in less than 30 minutes. The color is vivid and has a beautiful sheen. This table is sleek and versatile and matches perfectly with my purple and platinum theme. The delivery was a breeze. Thr packaging was damaged and the delivery person helped me open the box to ensure my table wasn’t damaged. I look forward to building my decor around this lovely showpiece. Making dining an event again: Fashioning a grand statement has never been easier. 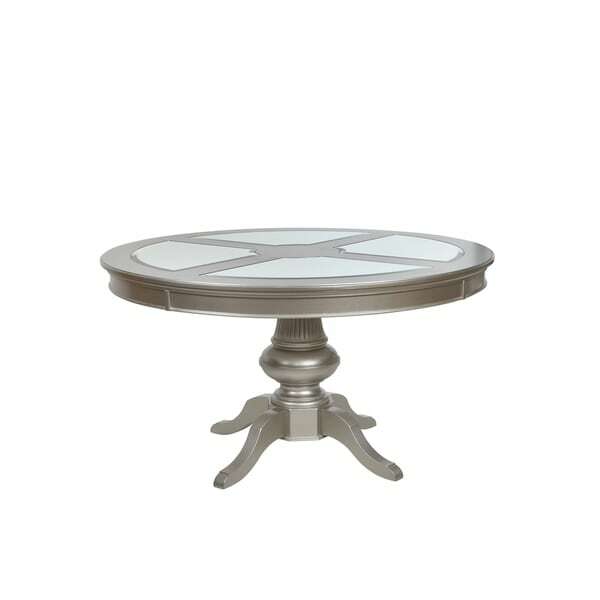 Park Ave brings glamour to any dining experience with its pearlized, platinum finish and its many decorative touches, including fluted legs, pierced molded back splats and beveled mirrors. Further enhancing the collection's distinctive style, all drawer interiors are finished in Avalon's exclusive, Regency Red™; the ultimate personal design embellishment. Dimensions 54.0 In. X 54.0 In. X 30.0 In. "Does this table have a leaf/expand?"